This weekend sees a full return to K-League action after Paulo Bento’s bow as international manager as both the K1 and K2 begin their descent towards the end of the footballing calendar and the cold and barren months of the close season. The table, of course, has an all too familiar look to it as Jeonbuk sit atop and Incheon sit precariously at the bottom and it’s to Incheon that we go for this weekend’s ‘Match of the Day’ as they welcome ‘rivals’ Suwon Bluewings to town. The K-League One table going into this weekend. Incheon are still bottom of the table despite suffering only one defeat in the last five matches although what a defeat that was as they got royally humped 7-0 by Gangwon on August 19th. Many a team would have folded after a trouncing like that but since that defeat they have picked themselves up and grabbed the relegation battle by the throat and defeated first Jeonnam then Ulsan with a 0-0 draw with Jeju sandwiched in between.That undefeated run keeps them only a single point behind 11th placed Jeonnam in the battle to avoid the automatic relegation spot and keep both Sangju Sangmu and Daegu continually looking over their shoulders as only five points separate 12th and 9th place (with FC Seoul just above that). 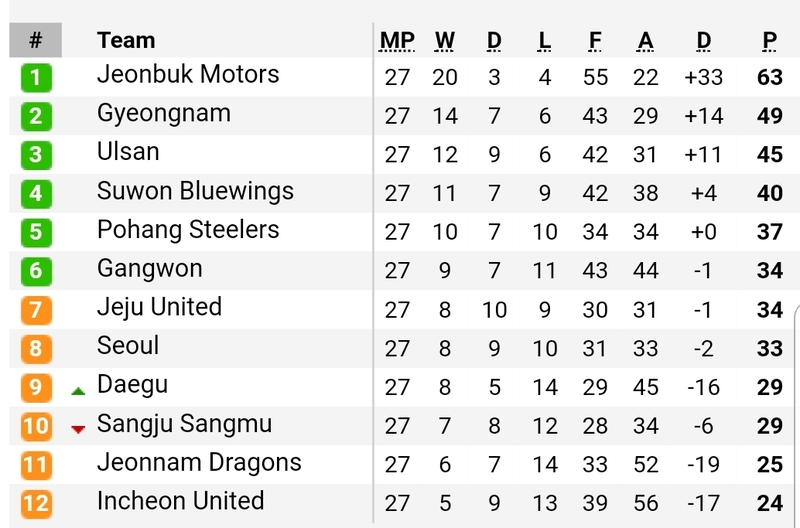 The games against Suwon Bluewings are always entertaining affairs and if the hosts can keepy that undefeated run going with a home win this weekend it would heap the pressure on the rest of the survival pack in the battle to remain in the top table for next year. If Incheon are to emerge victorious today they will need their ‘big game’ players to be on their day and coach Jorn Andersen will no doubt to looking to striker Stefan Mugosa (pictured left) to be the difference for his team. The Montenegrin has had a pretty sweet debut season with 13 goals so far and is a player more than capable of turning a draw or defeat into victory, you wonder just how much worse Incheon’s situation might be if it weren’t for him. The visitors to the Incheon Football Stadium today have had a few issues of their own of late as after ‘letting go’ their manager they trashed Jeonbuk in the Asian Champions League only to suffer an embarrassing 4-2 defeat away to Daegu which really only goes to cement their Jekyll and Hyde tendencies of the last few seasons. Bluewings could be excused for being less than 100% focused on the job at hand this weekend with the second leg of the aforementioned ACL Quarterfinals coming up midweek. Whether ‘caretaker’ manager Lee Byung-geun will be tempted to select a less than first choice field team and keep his main players for Wednesday will be interesting. However, if he does go for a full-strength team all eyes will be on the man with most famous ponytail in Korea, Dejan (pictured right) who after a shaky start in blue has been almost unplayable of late. He bagged a brace against Jeonbuk and has been one of the main reasons that Suwon Bluewings fans haven’t been deserting their team in even larger numbers than witnessed so far this year. He has quite rightly gained himself the moniker of ‘Korea’s greatest foreigner’ and has shown that even though the pace of old may be best viewed in YouTube videos he has without doubt lost none of the predator instinct that has served him so well throughout his career. With a total of forty-two matches down the years it’s clear that the Bluewings have had the upper hand over their hosts today having only tasted defeat five times. The last meeting ended with Suwon winning 5-2 at home after Incheon had battled back from 2-0 down to level things through a Mugosa penalty. The last of Incheon’s victories was back in December 2013 Nam Jun-jae getting on the scoresheet for United that day. There hasn’t been a goalless draw since way back in 2009 so it’s hopefully safe to say that we should see goals today, with Mugosa and Dejan not to mention Moon Seon-min and Yeom Ki-hun on the pitch we could see a fair few. Also in the K-League One this weekend we have…..